You have probably never been in a home quite like this. It is a very uniquely built home with an unbelievable location. This very large, multi-level home right is located right on Vaca Cut! It has beautiful, soaring views of Vaca Cut, Gulf of Mexico and the Ocean. The third level includes a large living room, huge master suite with sitting area, one guest bedroom and a full bath. The second level has 3 bedrooms, full bath, living room, and a bar area. On the first level is the kitchen, which has beautiful granite counter tops and stainless appliances, a dining area, and one bedroom with another full bath. Relax and enjoy the sweeping views from all levels of this home or relax by the pool (including heat with an additional charge) and watch the boats cruise by! Location, location, location… The direct access to the water is ideal for fishing, trips to the sandbar, or even great for evening boat rides to local restaurants where you can dock and dine! 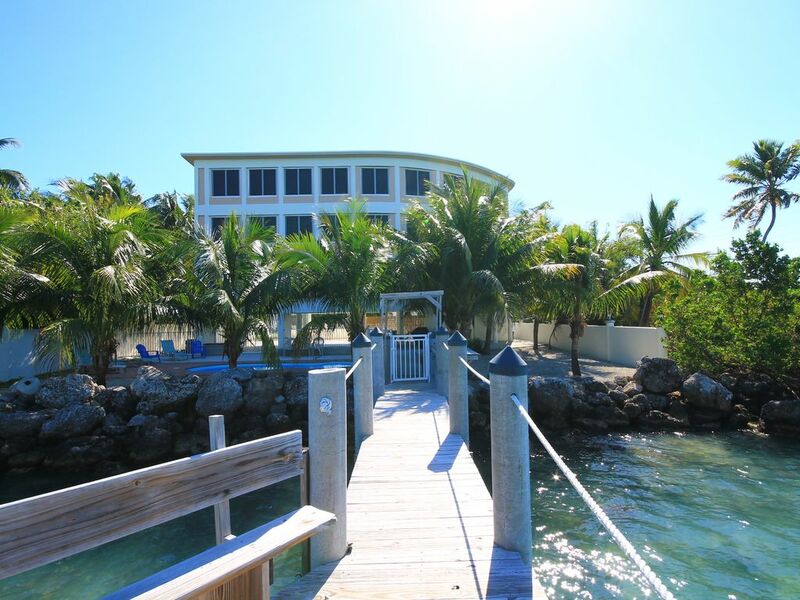 Marathon in general is an ideal location for a Keys vacation. Located directly in the middle nothing seems to be too far away. Spend a night on Duval Street in Key West and watch the sunset at Mallory Square or go mini-golf at Boondocks. Located near the Marathon Visitor Center and Chamber of Commerce. There is just so much for a guest to enjoy! The property will only accommodate 1 boat and must be an experienced boater due to the current. Gated yard, private pool (with pool heat ). Parking is limited to inside the manual gates only, there is no on street parking. Most boat trailers fit.. Please ask Sandy. This home is an amazing place to sit back and relax. Situated on Vaca Cut in the Florida Keys. This home asserts a tranquil and luxurious comfort that will enchant you. Best location on the key to rent. This is a great location, great fishing off the dock, great view. The dock is pretty difficult to get into I would only suggest experienced boat operators, the current changes 4 times a day and can be very swift. Some of the TVs don't work or few channels, but there is TVs in every room. In addition, I called about smoke alarms going off in the middle of the night and we had to disassemble it. That was 2nd night of a ten day stay. So, there was no smoke or fire alarms working during our stay. Overall this is an amazing place for a large family, groups, or friends to gather. I would still stay here again in a heartbeat. Great place, loved the view and hanging out on the dock. Great location, loved hanging out on the dock. Lots of stairs though if that's a problem for elderly people. The house was great. Boat ramp was close to the house. Overall our stay was great. The house was very clean when we showed up. The pool was amazing for after long day in salt water. Everything is really close don’t have to go far for bait, ice, or groceries. Parking was a lil tight but we did have a lot of vehicles. Great place, great stay, we will be back. Thank you so much for the kind review. We hope you will stay with us again on your next Keys vacation! It was amazing vacations, we feel welcome in the house, great house, the house have very nice rooms and great kitchen and view. we plan to come back. Thanks so much for the kind review and hope to see your family on your next Keys vacation! Best Vacation Ever! Amazing View! We will be back! A group of 12 of us stayed here and we had the BEST time ever! The house is huge and had 6 bedrooms, everyone having there own bed (SUPER Comfortable) and there was even room for more people to sleep. The pool area and view of the waterway and dock was amazing! We barely left the house, stayed there the whole week except for 1 day we went to Key West! If you have a large group/family this is the house for you! Shops, grocery stores, and restaurants very close by. My favorite thing was watching the afternoon sunset out back with breathtaking views of the Vaca Cut (see lots of boats coming in and out each day). Very relaxing and peaceful. We brought our own boat but will probably just rent one next year (water can be rough at times on this waterway) we swam off the dock multiple times and floated, but sometimes the current was to strong (water is only about chest deep off dock so you could touch the ground, we wore booties on our feet)......BEST VACATION EVER......the only thing i would say is that the kitchen needed a little more cooking supplies (mixing bowls, stirring spoons, cooking utensils) and the gates and parking are super tight if you have SUVs or trucks (but they will fit). WE WILL STAY HERE AGAIN! IT IS TOTALLY WORTH EVERY PENNY!!! Thank you so much for the wonderful review. We love hearing our guests had a great vacation and we look forward to your return Keys trip!